Thanks to the protecting powers, the United States of America succeeded by Switzerland in December 1941, 39 rue du Faubourg St Honoré was untouched during the Second World War. Even this level of protection might not have been enough were it not for the particular bravery of two British local staff, William Robert Chrystie and Ernest Edward Spurgeon and their wives, who lived throughout the War in cold and bleak circumstances in the West Pavilion. Duff Cooper, with his wife Diana, arrived in Paris as ambassador in mid-September 1944. The house was sufficiently emptied of its storage and returned to working order for the Coopers to move in during the following month. 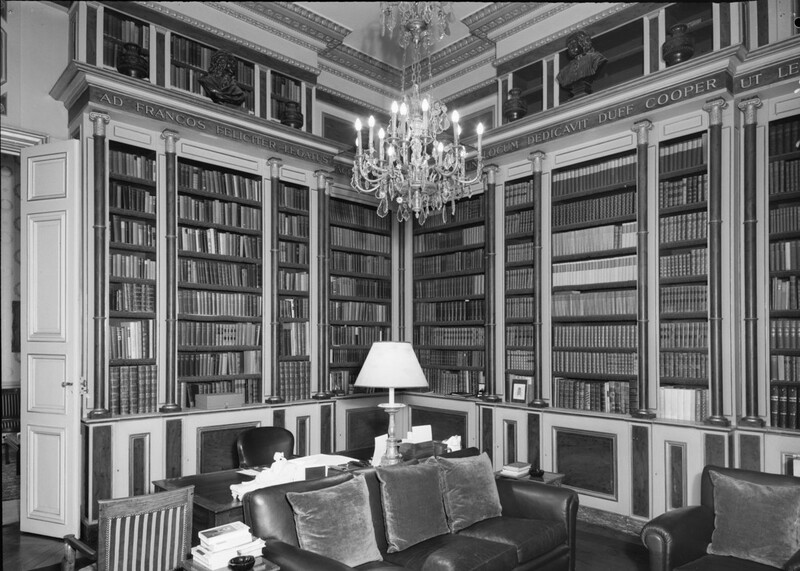 Cooper wasted no time in pursuing his generous idea of offering to give the embassy sufficient of his own books to form the nucleus of a good chancery library if the Ministry of Works would pay for re-arranging his sitting room as a study and library to house the collection. The Ministry warily accepted the offer, and the project started with the long-standing local architect, M. Chatenay, producing a conventional but affordable proposal. It fell so far short of the Coopers’ aspirations that they quickly decided to seek a more imaginative design from their friend Charles de Bestegui, art collector and interior decorator extraordinaire, which they then commissioned Georges Geoffroy and Christian Bérard, both decorators, to carry out. Sourcing materials and keeping costs down were difficult at the end of the war, but the team was brilliant at producing luxurious effects from such cheap materials as were available. The eventual cost was more than double Cooper’s first guess of £1,000, but the attractiveness of the result quelled all misgivings, and the room, as well as the books, remain highly prized. In 1965, a rash ambassador’s wife, Lady Rachel Reilly, wanted to repaint the tortoiseshell colouring, painstakingly based on a St. Petersburg decoration, with three tones of pale grey. Word reached Diana Cooper, 73 and widowed, just in time and she successfully pulled every string she knew to have the proposal abandoned. No successor has attempted to assault her other main decorative contribution to the house, also executed by Christian Bérard, which was to dress her bathroom in the manner of a Napoleonic military campaign tent. It was a struggle in bleak post-war conditions to bring the house into full use again and to upgrade its services. The marquise was accidentally demolished by a coal lorry in 1949 and never replaced. 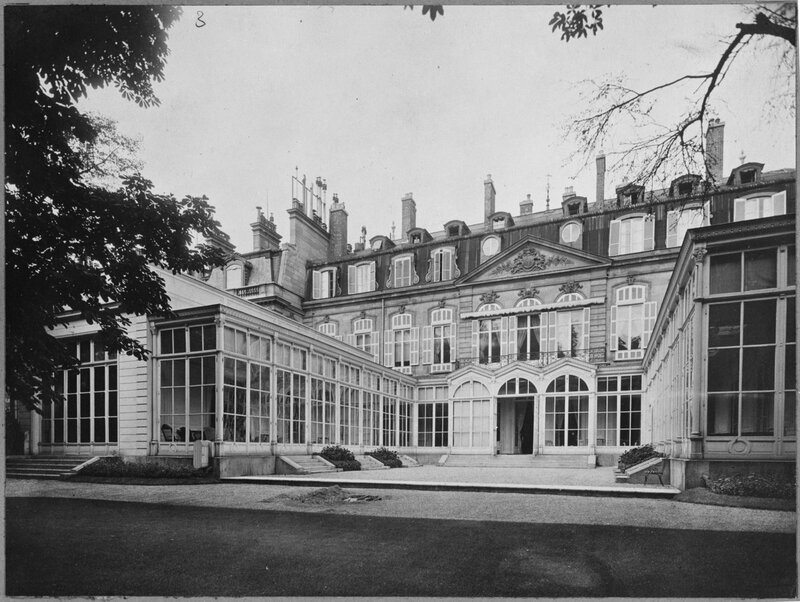 In 1951, the ambassador’s wife, Lady Harvey, infuriated the Ministry of Works by painting lines for a badminton court on the newly polished ballroom floor but David Eccles, the Minister, thought that the French would be more delighted than surprised by this initiative. The lines were nevertheless promptly removed and the floor repolished. The main rooms were not fully re-hung and re-arranged until the second half of the 1950s during the incumbency of Sir Gladwyn Jebb. His energetic wife Cynthia was devoted to the house and its history, and had some success in rallying the Ministry of Works to her cause of upgrading the house to more modern requirements. In the mid-1950s, several guest bathrooms were inserted into the second floor, and the kitchens were refitted in 1954: perhaps for the first time, and certainly not for the last, the £7,000 spent on the kitchen excited the ridicule of a section of the press. The whole house was re-wired in 1957. At Cynthia Jebb’s prompting, the Ministry sought an historical report on the house from Dr Maurice Craig, a member of its Inspectorate of Ancient Monuments. His ten page report, of 21 November 1958, was the first academic assessment in English of the house and it made the Ministry realise the extent of its responsibility for the house. One of Craig’s recommendations was that a fuller study should be undertaken, which the Ministry, on the advice of Sir John Summerson, commissioned from Dr Robin Middleton . It ran to 87 pages, plus 228 notes and an appendix of references. Neither study was intended for publication, nor was published: each had a rather snooty tone which infuriated Lady Jebb, and included impracticable suggestions, like demolishing the glazed gallery, which she was spirited in ridiculing. 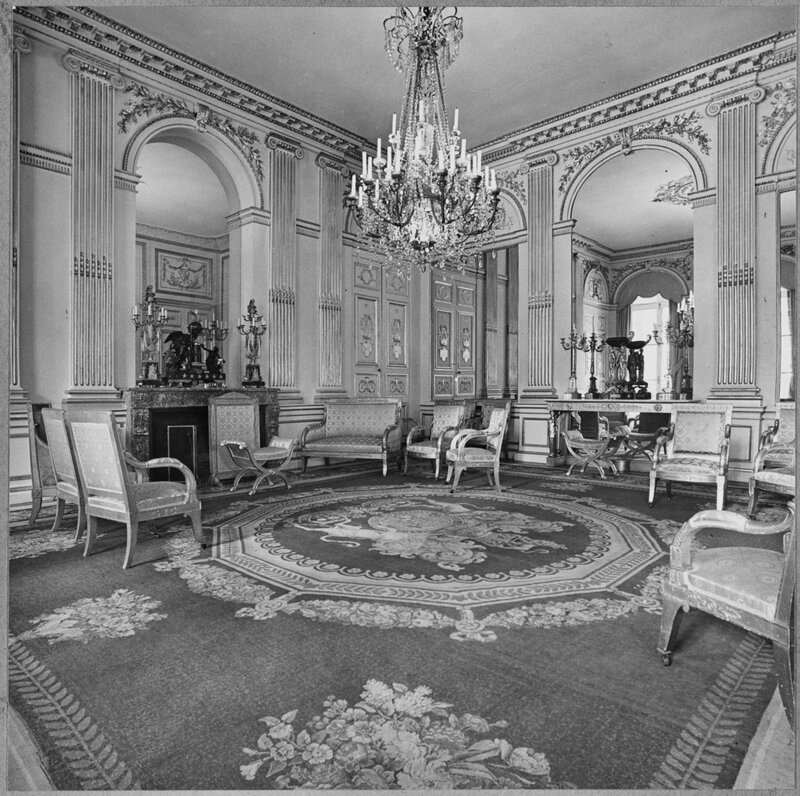 The ballroom floor was relaid in 1973; three of the Salons – Blanc et Or, Vert and Bleu – were renovated in 1974-6: and Empire furniture gradually replaced the Victorian accessions. The house was connected to the Paris District Heating System in 1980. For much of this period, the retained local architect in Paris was M. Gamba: he was succeeded in 1996 by Olivier Nodé-Langlois. An innovation from the Jebb incumbency was the appointment of an eminent British curator to visit Paris annually to keep an eye on the welfare of the valuable chattels and furniture (see Room for Diplomacy p.365). John Cornforth fulfilled a wider role for various of the FCO’s historic houses from 1980 almost until his death in 2004 but Paris was his first and chief pre-occupation. In 1981, he joined an FCO/PSA working party to consider a future strategy for the house. His mix of scholarship, pragmatism and persuasion was invaluable in steering a way through a wide range of competing considerations: historical/operational, curatorial/representational, Empire/other styles, French/British, and formal/ informal. The subsequent programme started in 1982 and was scheduled to last six years but funding realities extended that to almost a decade. A working rule throughout the programme was that not more than one major room should be out of commission at any time. The practice of treating the guest rooms on the second floor in English country house style was retained. Cornforth introduced David Mlinaric into the programme to help decorate several of the rooms, notably the first floor ante-room. Joseph Friedman was also commissioned to research a deeper history of the house and its chattels than any hitherto written. His resulting six volumes in 1986 (unpublished) have since played an important part in informing restoration decisions. 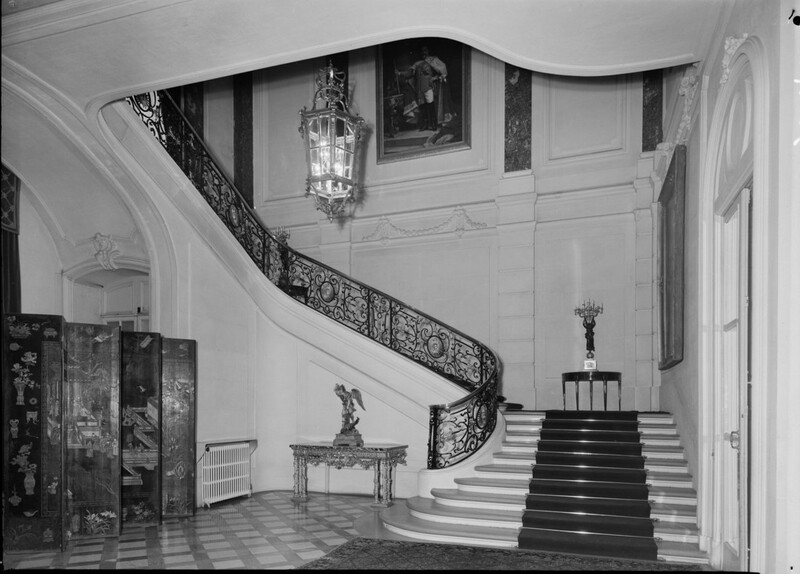 The first rooms to be restored, in 1983, were the Anteroom and the Ambassador’s bedroom on the first floor. 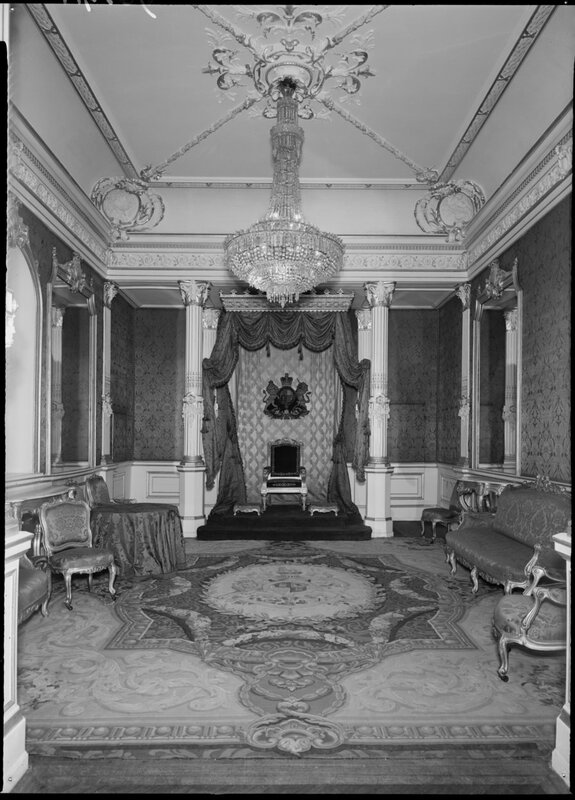 In 1984, the marble floors in the hall and gallery were polished, and Pauline’s lit de parade was moved from the Ambassadress’s bedroom on the first floor to the Victoria Room, re-named the Salon Pauline, on the ground floor, where it could more conveniently be shown to visitors. 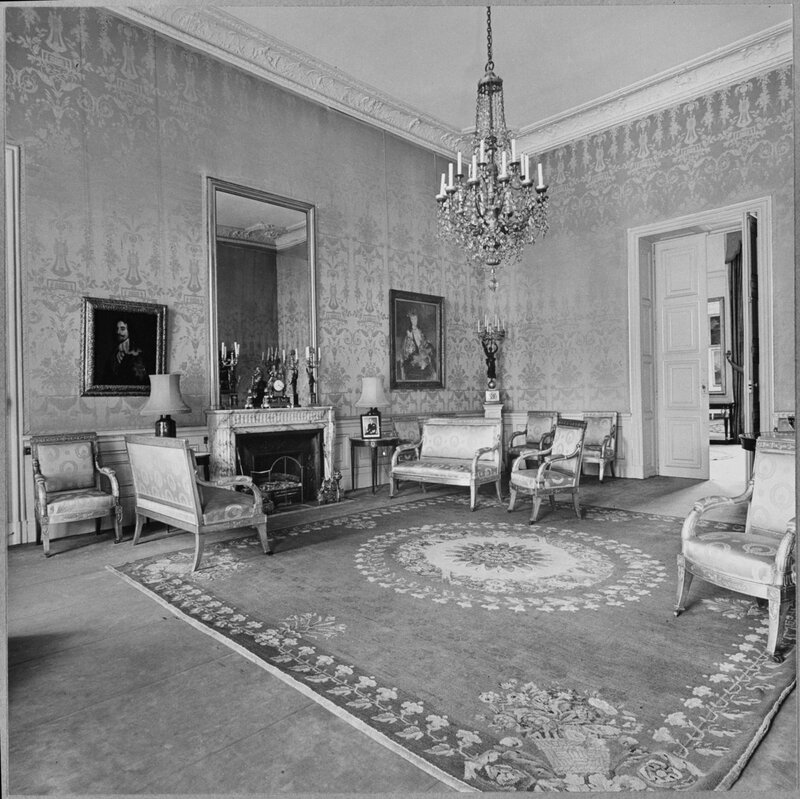 In 1985, the Salon Rouge was restored and a mirror added on the east wall. In 1986, the Salon Jaune was restored, and in 1988 the Cooper bathroom. Also in that year, a reduced version of Canova’s statue of Pauline was presented to the embassy: its plinth, designed and painted by Alec Cobbe, followed in 1990. 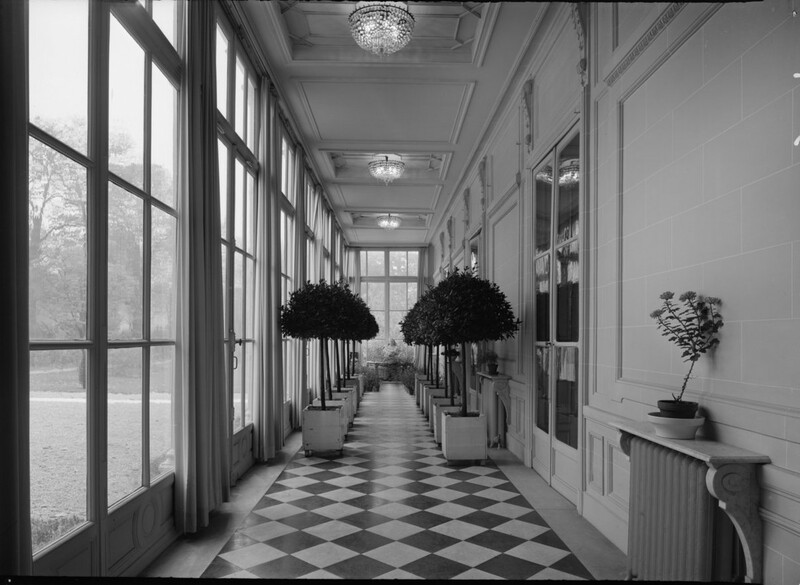 In 1991, the State Dining Room was completely redecorated, all the windows and door frames in the glazed gallery were replaced, and the Salon Vert et Or on the 1st floor was restored. That marked the end of the programme initiated in 1982, but other significant works have taken place subsequently. In 1996/7, all the roof coverings were renewed, and a new laundry was installed. 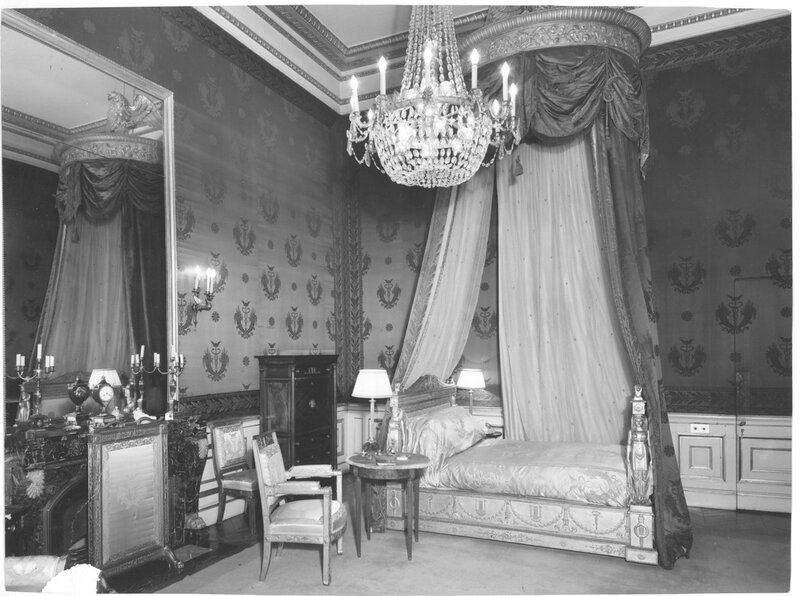 In 1998, the First Empire furniture in the Salon Bleu and Salon Pauline was restored, and Pauline’s bed was rehung in the same silks as the new curtains. In 2001, the Ambassadress’ study was moved to the Ambassador’s dressing room and (in Cornforth’s last project) her former study became the Wellington Room. Also in 2001, a new modern lift was, at last, inserted to serve all floors to ease chronic circulation problems. In 2009 the main stair was redecorated. I am indebted to Ben Newick, who has been the Butler at the residence since 1981 (and has lived in it throughout), for his help with the sequence of recent events. Garden frontage, 1964, with glazed galleries and Ballroom on the left and dining Room to the right, 1964. Pauline’s lit de parade in Pauline Bedroom 1964. 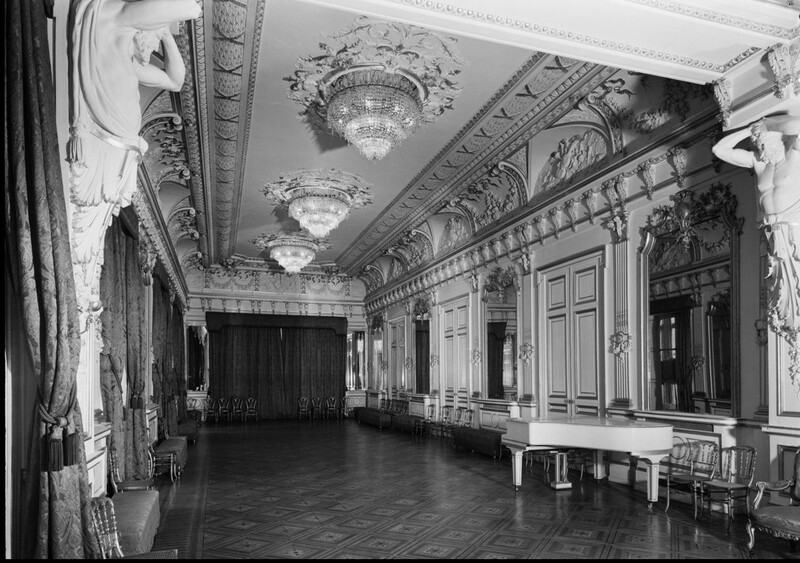 The Gallery, beside the Ballroom, 1964. 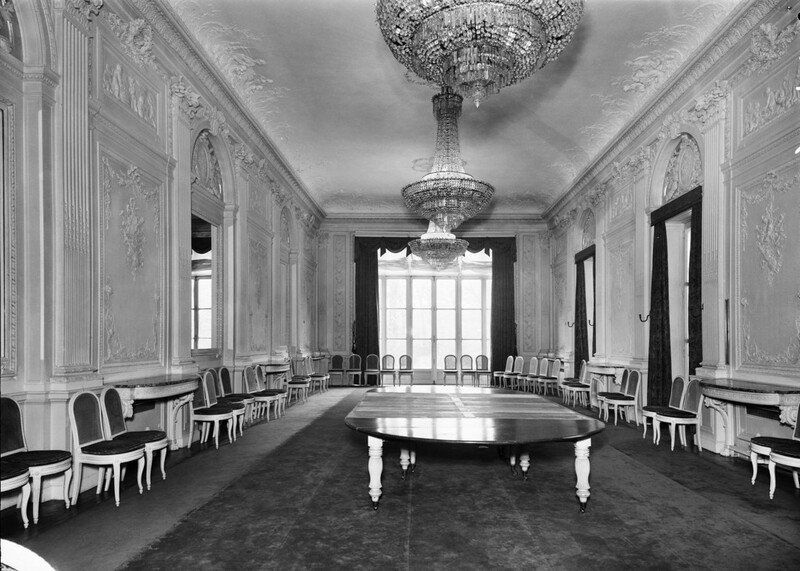 The State Dining Room, 1964. Salon Bleu (present name), 1960. Salon Jaune, 1960, formerly Salon Carmelite. 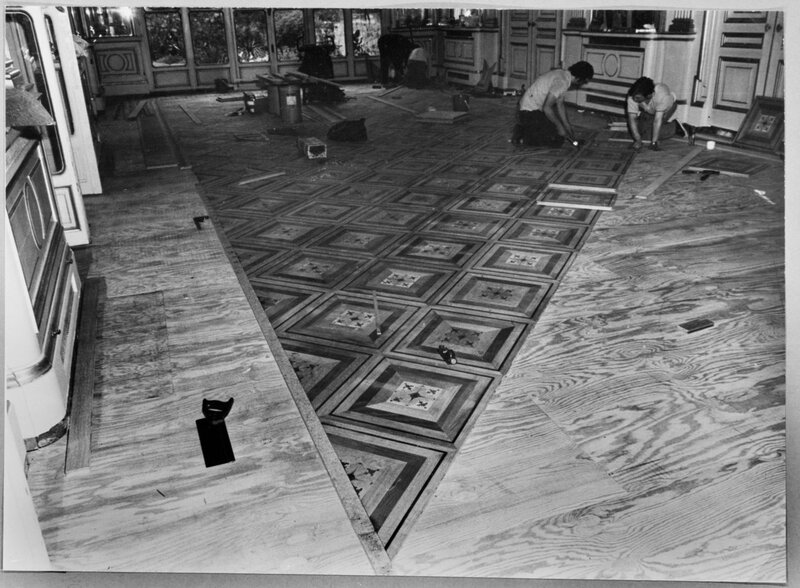 Relaying the Ballroom floor, 1974.